The Clock House Cabins are slightly different as their roofs are not just your usual pent roof or apex roof. They feature an extra apex, also known as a ‘clock tower’ above the entrance providing enough room to optionally place a clock or feature outside, above the doors, if desired. 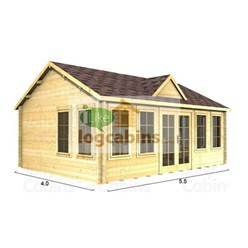 These cabins are available in sizes starting from 16ft x 13ft and up to the size of 23ft x 11.5ft. Due to this range being of a larger size, they are most popularly used for living purposes such as an additional bedroom or even similar to a house, featuring a small kitchen/diner, bedroom and en suite. You could use this cabin for anything. Even maybe a gym or a music studio. Due to this range of cabins extra apex feature above the doors, it really sets this cabin off, making it look very different from the rest. By adding this extra building to your home you could be helping increase the value of your house, make your house more appealing for buyers, or to simply complete your home for you to stay for many years to come. With its longer windows, available in double glazing or single glazing, allows the much desired sunlight into the cabin. The windows are opening windows with the handles included, which is great for those lovely summer days to allow air to circulate the building. Perfect if you’re spending a lot of time inside the cabin. Door handles and a cylinder lock for the door is also included with this cabin so no need to worry about the small extras as they will be included. These cabins are available in different wall thicknesses, 34, 44 or 70mm and the walls consist of wind tight chalet connections creating more sufficient insulation and security. An optional extra also available is a veranda which makes a beautiful outside seating area to your cabin and can finish your cabin off just a treat. Our log cabins are delivered untreated so you are required to paint/treat the building with water based treatment for outdoor wooden buildings once you have built the cabin and do so once or twice every year. Be sure not to use standard household paint as this will not provide the wood the moisture it needs and the paint will simply flake off. 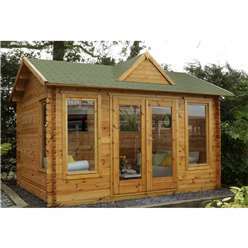 Our log cabins are delivered only and do not include the installation service as standard. If you are interested in opting for our installation service, please contact us for more information and for a quote. 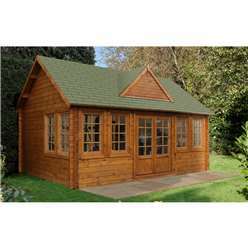 We recommend all log cabins are situated on a solid, level, preferably a concreted or paved area. If you don’t currently have an appropriate base ready, our installation team can also offer this service too. Our installation team have over 25 years’ experience so you can be sure your log cabin and/or the base will be carried out to the very best standard it could possibly be. Don’t hesitate and call us today for your more information and a personal quote. The majority of log cabins have apex or pent roofs. These are the log cabins we are all familiar with, but if you are looking for a statement log cabin – one that stands out from the crowd – you should definitely consider a clock house log cabin. What is a Clock House Log Cabin? A clock house is another name for a clock tower and it’s a place where a clock would normally sit. In this instance, a clock house is an extra apex on the roof of your log cabin. Usually the clock tower apex is placed at the front of the log cabin, above the entrance, where it acts as a focal point for the eye. As the name suggests, you can place a clock on the front face of the apex, but if this doesn’t suit, you can use it to display a piece of artwork, or even a name plaque. The clock house is a feature included in many of our larger log cabins. Most people opt for a larger cabin if they are looking to add extra living space to their home or need a sheltered area in the garden for outdoor entertaining. Clock house log cabins are both attractive and functional: on the one hand you have plenty of space to play with, and on the other you can enjoy having a quirky clock house log cabin in your garden. § Garden room – Log cabins are typically sited in the garden of a home, so they can be used as a functional living space during the summer. Since you will want to make a feature of a clock house log cabin, it makes sense to site it somewhere prominent, such as adjacent to the main house. That way you can wander between the two easily. § Peaceful adults-only sitting room – If you, like many parents, are surrounded by noisy older children and teenagers, wouldn’t it be glorious to have your own living room, far away from the chaos of the main house? A clock house log cabin is the perfect place to go when you need a break. You can take a book, relax in the comfort and serenity of your own space, and leave the kids to their games consoles and tech gadgets for a couple of hours. § Music room – Listening to or making music is not a quiet pursuit unless you plug in headphones. But where’s the fun in that? A much better solution is to create a music room out in the garden where your passion for thrash metal or Beethoven isn’t likely to disturb anyone. You can practice the cello, strum an electric guitar, or simply listen to your favourite tunes on Classic. FM to your heart’s content. § Art studio – Creating art requires plenty of natural light. Rooms in the home are rarely light enough unless it’s an attic with roof lights, but an outdoor log cabin is perfect because you can have windows on every wall, plus roof windows. Turn your clock house log cabin into an outdoor art studio and enjoy creating beautiful art in an inspirational space. § Kids’ play house – Children love to have their own play space. It gives them the opportunity to let their imagination run wild. A play house log cabin can be transformed into a pirate’s ship, fairytale castle, dragon’s den, or even the local village shop. The interior might well end up very messy, but if appearances are important to you, at least the exterior with its clock house will look super stylish. Aside from the wide range of different uses, another point worth making is that a log cabin of this quality is sure to add value to your property. Anything that makes your home stand out to prospective buyers is a good thing. Often buyers go and view multiple properties in a single day and after a while they all blur into one. 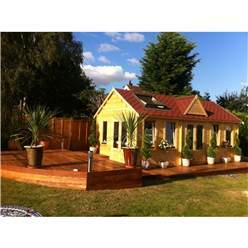 A gorgeous clock house log cabin in the garden is sure to make your property stand out from the rest. 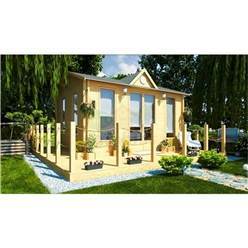 It will also appeal to the more discerning buyer, so consider a clock house log cabin a smart investment. Wall thickness is very important when looking at log cabins, not least clock house ones. The more time you think you will be spending in your new log cabin, the thicker the walls need to be. So opt for a log cabin with at least 44mm walls if you plan on using it for much of the year – and if you want to use it as a second living room, it is advisable to look at clock house log cabins with 70mm walls. For more information about any of our log cabin ranges, speak to one of our customer service team today.